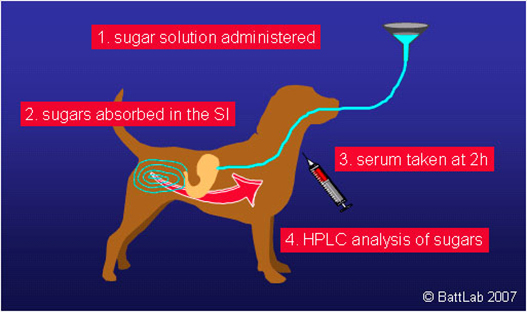 Assessment of intestinal permeability is a very sensitive, non-invasive technique to detect and manage small intestinal disease in dogs. This is a simple procedure involving oral administration of a sugar solution containing lactulose and rhamnose, and analysis of a single blood sample taken 2 hours later. 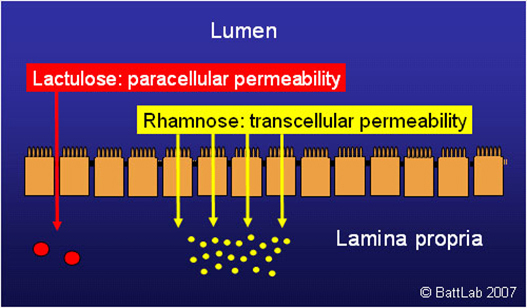 The normal small intestine is lined by finger-like villi covered by absorptive epithelial cells which form an effective barrier between the lumen and the lamina propria. Permeability testing can be more helpful than intestinal biopsy alone in the detection and management of intestinal disease. Pathological changes in biopsies may be non-specific, giving no indication of cause (eg “inflammatory bowel disease” could be due to dietary sensitivity, bacterial overgrowth or may be idiopathic), or biopsy findings may appear normal despite damage (eg bacterial overgrowth). Application of permeability testing to identify dietary sensitivity as the cause of intestinal damage is illustrated in the figure below. 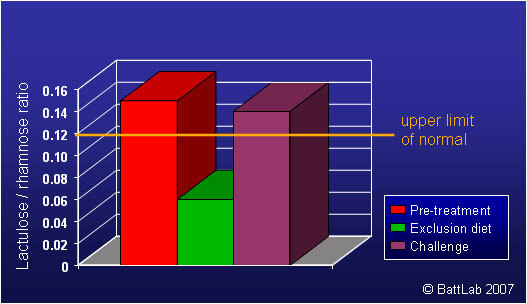 This shows test results in a 3 year-old Golden retriever with chronic vomiting and diarrhoea. High permeability pre-treatment indicated intestinal damage which resolved on a chicken and rice exclusion diet with relapse on dietary challenge, indicating true dietary sensitivity. Permeability testing has proved particularly useful to assess the severity of mucosal damage in small intestinal bacterial overgrowth (SIBO) – also known as “antibiotic-responsive enteropathy) – and to help long-term management. Intestinal permeability has been shown to be increased in approximately 50% of clinical cases with SIBO, even when there are no histological abnormalities. 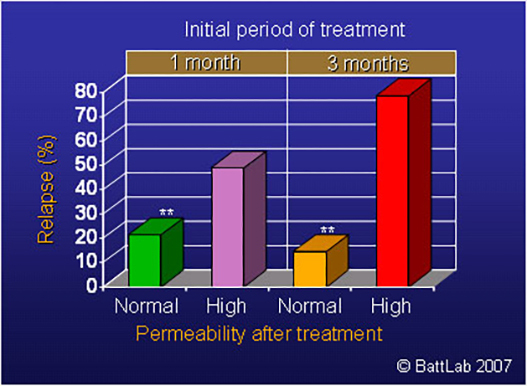 Normalization of intestinal permeability following 4 weeks of antibiotic therapy indicates successful repair of mucosal damage. This figure shows that dogs with high permeability after 4 weeks antibiotic therapy are 3 times more likely to relapse despite an apparent clinical response to treatment, and continuation of antibiotic therapy is therefore recommended. Differences are more marked after 3 months of treatment as dogs with high permeability are approximately 8 times more likely to relapse. A persistent high permeability in dogs with a poor clinical response should prompt further investigation of underlying disease, such as “inflammatory bowel disease” or neoplasia.